Results in Just One Visit! Our Santa Ana dental office, OC Dental Center, is able to give the best teeth whitening available through our special teeth whitening system called Start Pure®. The procedure itself is only about 45 minutes to an hour. We have patients who in this short period of time see their teeth reach 8 shades whiter! It's also great for people sensitive teeth. Making your teeth whiter has never been easier with our Start Pure® teeth whitening system. What Is Start Pure® Teeth Whitening? Start Pure® is an LED light system that uses multiple colored lights that can actually get rid of bacteria, whiten teeth, and enhance gum tissue. So many people want to whiten their teeth in a quick and easy way, and Start Pure® teeth whitening treatment allows us to do that using blue light technology. Why Start Pure® Whitening over Gels, Trays, or Whitening Strips? Better for Sensitive Teeth - Many brands of whitening strips, gels, or pens can be too strong for those with sensitive teeth and can cause discomfort when trying to eat hot or cold foods. With Start Pure® you will notice that there is little to no tooth sensitivity after the procedure. Faster, Professional Results - The great thing about having a professional teeth whitening from one of our experts at OC Dental Center, is that we will be able to whiten areas of your teeth that would be difficult to reach with simple whitening strips. (( ASK POONEH ABOUT THIS )) We also perform a teeth cleaning first to get rid of tartar buildup so more surface area of your teeth can be whitened. 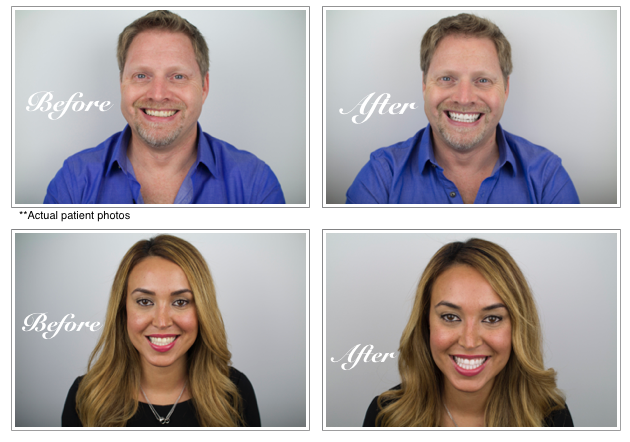 With just a 45 minute-to-one-hour procedure, we have patients seeing their smile reach eight shades whiter! First we will review your dental history and also inspect your mouth to see what current dental work you've had done. We will make sure to be gentle and careful to work around different tooth fixtures like crowns, bridges, and fillings. First we perform a teeth cleaning so we can rid your teeth of plaque and tartar buildup which will give us a clean foundation for your whitening. Then we will put on special glasses to protect your eyes from the LED light from our teeth whitening machine. Next, our Start Pure® machine has different colored lights that will help eliminate bacteria, promote healthy gum tissue, and, of course, whiten your teeth! Step 3 - Enjoy Your New Smile! Say goodbye to stained and yellow teeth, thanks to OC Dental Center! For the best place to whiten your teeth in Santa Ana, visit OC Dental Center today!